The introduction of Wild Cards greatly increases the possible moves and the level of challenge in Numero®. 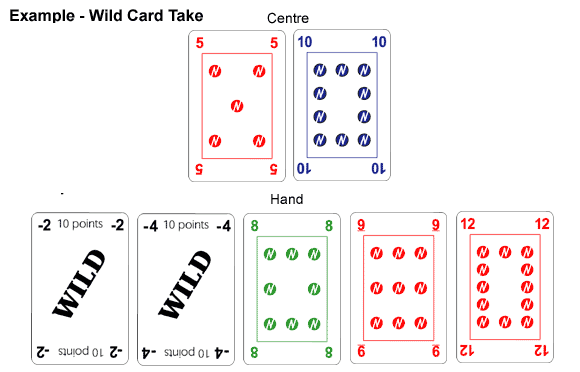 or, an even better move, after playing the –2 onto 10 to equal 8, is to play the –4 Wild Card onto the 5 to make 1, leaving you with still another turn. 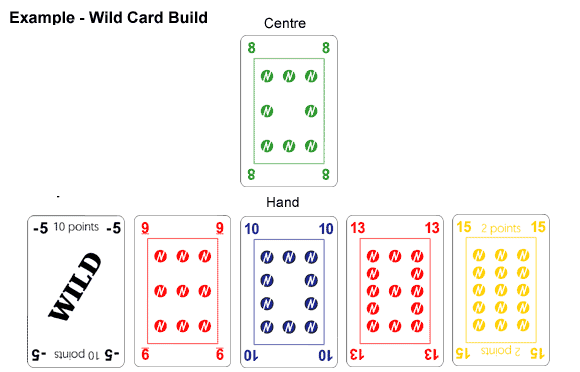 You then combine the 8 (10 – 2) and the 1 (5 – 4) to make 9 and take with your 9, winning a total of 5 cards. At the end of this turn, you would then restore your hand to five cards, drawing from the deck. If you cannot take, you might use your Wild Card in a build. However, playing a Number Card would end your turn, and you would have to wait and hope to take in your next turn. You may discard a Wild Card; however, your turn is not complete until you have played a Number Card from your hand. If you have five Wild Cards in your hand, discard all five cards, ending your turn. Then restore your hand to five from the deck. To avoid this situation, should you find yourself with four Wild Cards and one number card, yet unable to take, then a suggestion is to discard one or two Wild Cards (perhaps your most difficult to use) and then complete your turn by discarding your only number card. Hopefully, you’ll pick up more number cards and open your hand up a little!